Who wouldn't give $105,000 to gain $222 million? Lockheed Martin Aeronautics Co. (LMAC, Ft. Worth, Texas) did and in the process was able to fabricate dimension-critical aerostructures more efficiently, more accurately, and faster. 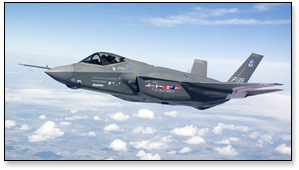 LMAC is a major components manufacturer for the F-35 Joint Strike Fighter (JSF), the next-generation military fighter jet being developed by the U.S. Department of Defense (DoD) and eight other partner countries. As part of its fabrication process, LMAC performs postmold machining of carbon fiber-reinforced wingskins to net edge shape and size. The cutting tool selected at the start of the project, however, was able to last only 9 linear ft (2.74m) at one third the total material thickness. In addition, cutting performed by the selected tool often produced excessive delamination, thereby reducing overall quality of the wingskin. As F-35 development and manufacture progressed, timelines and delivery dates become more compressed and LMAC needed to find a way to cut wing skins faster and without delamination. The company asked the National Center for Defense Manufacturing and Machining (NCDMM, Latrobe, Pa.) to assess the problem and provide a more efficient solution. NCDMM started by evaluating cutting tool geometries under a variety of application parameters. When cutter geometries and their associated cutting forces were determined, tool life and delamination were measured and evaluated. Test results lead to a better understanding of required tool geometry, material and coating. To develop a new cutting solution, the NCDMM worked with several Alliance Partners, including Amamco Tool Co. (Greer, S.C., 7105), Diamond Tool Coating (N. Tonawanda, N.Y., 3687), Kennametal Inc. (Fort Mill, S.C.), McCullough Machine (New Derry, Pa.) and RNDT Inc. (Johnstown, Pa.). The resulting tool relies heavily on DiaTiger, a chemical vapor deposition (CVD) multi-layered diamond coating produced by Diamond Tool Coating and designed specifically for machining composites, including fiberglass reinforced plastics, graphite, carbon fiber composites and ceramics. The new design and new material increased tool life from 9 linear feet at one-third material thickness to 57 linear ft (17.37m) at full material thickness. Test coupons ultrasonically inspected by LMAC verified the integrity of the parts. LMAC now can machine a complete wingskin using only two cutting tools - one to rough and one to finish - instead of the 24 cutting tools used previously. Cost savings per aircraft is approximately $80,000. If LMAC manufactures 2,783 F-35s as planned, total cost savings over the life of the project is approximately $222.6 million - not including conservation realized via scrap reduction and time savings. Cost of the project was $105,000.